Home Companies Changzhou Xiangjin Precision Machinery co.,Ltd. The tie rods are made from billet aluminum and are in a hexagon shape. 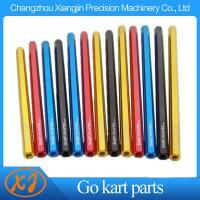 The tie rods have 8mm left and right hand threads and come in fourteen different sizes in and four different colors. ChangZhou Xiangjin Precision Machinery Co., Ltd Was Established In 2006. And Is Growing Into A International Oriented Company With Her More Than 8 Years Professional Experience In The Field Of Precision Machining. It Is Located At Xinbei District, Changzhou City, Jiangsu Province, China. Our Productivity Is More Than 2 Million Parts Per Year. Our Company Is A Medium Modern Enterprise, Mainly Producing And Selling Motorcycle Parts: Auto Parts And Aluminum Alloy Welding Products, All The Goods Are Export Overseas. Also, Our Company Owns The Internationally Advanced CNC Machine Tool Equipment, And Advanced Surface Treatment Equipment, A Batch Of Senior Management And Technical Staff. Our Company Has Won Wide Recognition And Praise For Our Stable Quality And Constant Innovation. We Are Committed To Sincerity, Specialization, Innovation And Service. We Sincerely Look Forward To Cooperating With Global Client Hand-in-hand And Making Our Products Become A World Known Brand. Our Company Is Specialized In CNC Machining Parts And Welding Of Various Materials, Our Products Apply To With Automobile And Motorcycle. Production Equipment: 5 Axis Machining Center, CNC Lathe. Welding Equipment: Argon Arc Welding Machine. 2. According to customers requirements. 3. Suitable for sea shipping and air shipping. By express, by sea or by air.